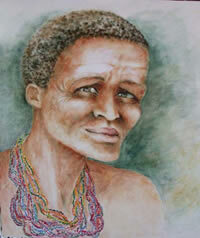 Kate retired from UCT in 1996 due to illness and resumed her oil painting in 2000, after a 13-year break. In 2003, Kate, with her husband, Zoology Professor Bryan Davies, moved full time to Pringle Bay, which is part of the internationally recognized Kogelberg Biosphere Reserve. Here they are very involved with the creation and maintenance of Conservation Villages. 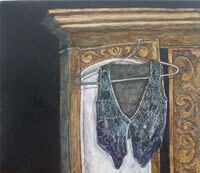 Kate continues her oil painting of the things she loves: portraits, baboons, landscapes, flowers and interiors. Both Kate and Bryan have a unique relationship with the Chacma Baboon troop in the area [see film: Healing Power of Nature: Distant Cousins, SABCTV3, 2008] and since 2006 Kate has been painting various members of the troop. She and her husband are currently writing a book on their experiences with them. 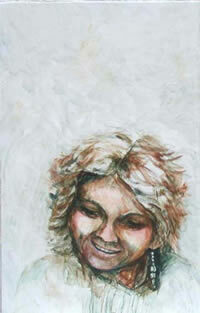 Because of her fluctuating health and energy (she is disabled though a spinal cord injury resulting in quadriplegia), Kate does not manage to search out galleries or to hold exhibitions, but has periodically held her own "Exhibition through the Ether" [on email] since 2001; and also exhibits her work on her own web site http://jagoeart.co.za, and other Art Sites on the Internet. 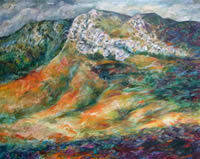 She has paintings in private collections in the USA, Canada, New Zealand, Australia, Scotland, England, France and South Africa.